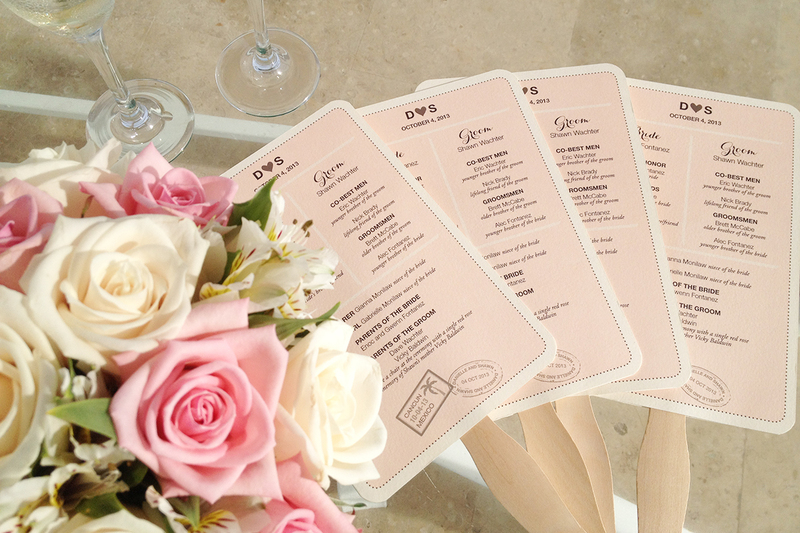 Today we’re discussing destination weddings! In most cases, these getaway weddings have an entirely different set of rules when it comes to timelines and other details. Most wedding advice focuses on local events so today we’re focusing specifically on you, the adventurous couple planning a wedding that requires boarding a plane with your wedding dress and dancing shoes in tow. So what counts as a destination wedding? We generally consider destination weddings anywhere your guests’ wouldn’t expect you to get married. For instance, if you live in New York City, it isn’t a far stretch for you to get married in the city, on eastern Long Island or in nearby New Jersey or Connecticut. Although you and most of your guests may have to travel a couple hours to get to the venue, we wouldn’t really consider this a true destination wedding. That being said, if you live in NYC and are planning a wedding in Palm Beach, Florida or The Bahamas where you don’t have any family connections, then congratulations, you’re hosting a destination wedding. Step One, Save the Dates! Remember, just because you’ve dreamed of a wedding in Costa Rica for years, the majority of your guests probably have no idea you’re planning to exchange vows outside of your hometown. We recommend sending out save the dates early. If your wedding is over a year away, wait until the one year mark. If you’re under a year, call us! It’s time to create a fabulous design and send them out! Wedding websites are almost essential for destination weddings. Create one now if you haven’t already and include it on your save the dates. It’s an easy way to keep your guests posted on hotel and travel information. Sites like The Knot and Wedding Woo make building a website easy and cost-effective. I highly recommend spending a few extra dollars for a custom domain name. It’ll be easier for your guests to remember and looks a thousand times nicer in print. 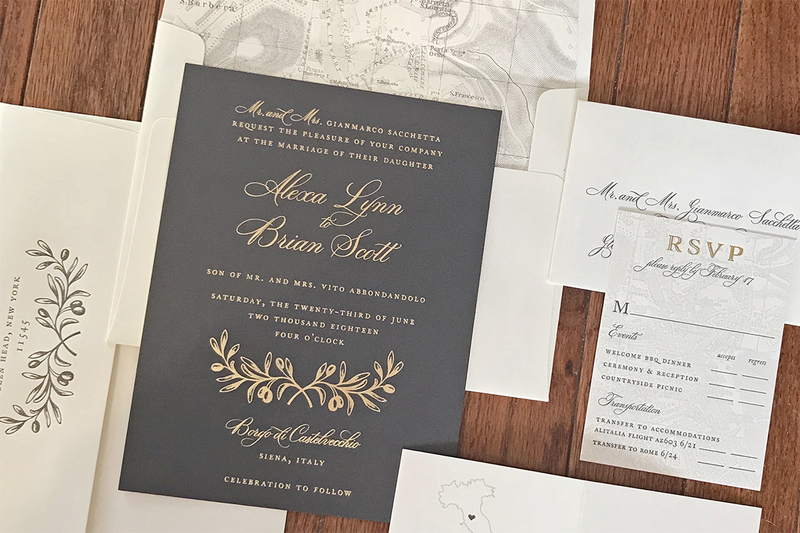 After receiving your save the date, many of your guests probably already renewed their passports and booked their flights, so the invitation may seem like just a formality. This isn’t entirely the case though. 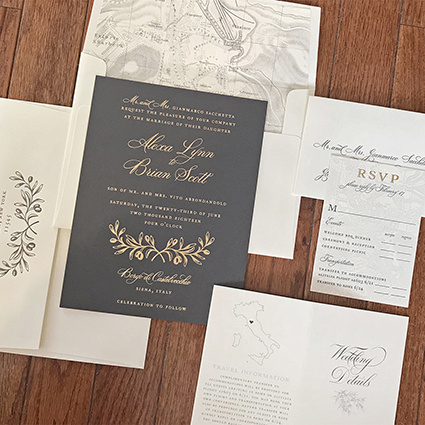 Some guests need to see the invitation before they make their plans official. In addition, as with any other wedding, it’s important to get a “yes” or “no” so you can plan the seating chart and finalize any day-of details. This is also a great way to get head counts for any other events you’re planning — a beach barbecue, welcome cocktail party, sightseeing adventures or a farewell brunch. 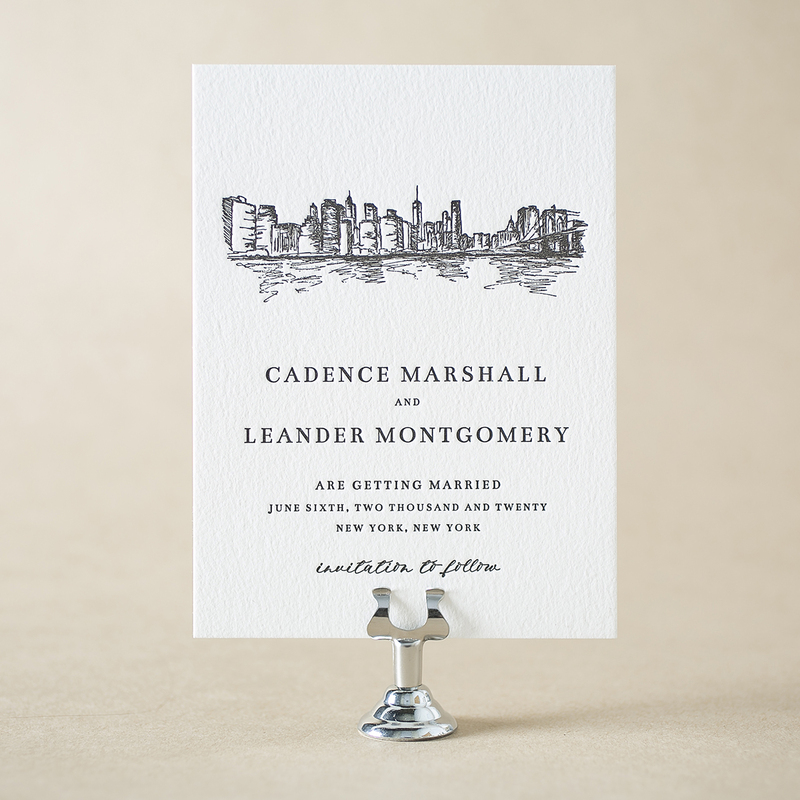 For destination weddings, the invitations can go in the mail anywhere from 2–6 months in advance. It really depends on the size of the wedding and the complexity of travel arrangements. We can help you decide this during our appointment. 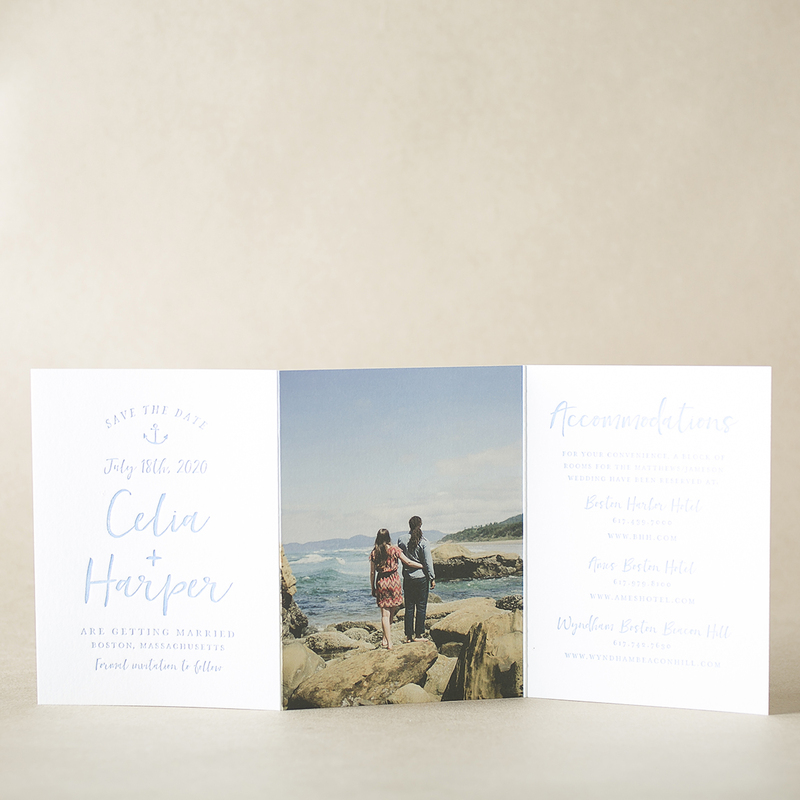 In the months before the big day, we’ll work with you to create menus, programs, and seating cards. Keep in mind, you’ll have to either bring these elements with you on the plane or ship them to the venue so you’ll probably want to avoid a large seating chart or welcome sign. Ready to start playing with paper??? Give us a call or meet with us at one of our Long Island, New York studios. Live out of town? 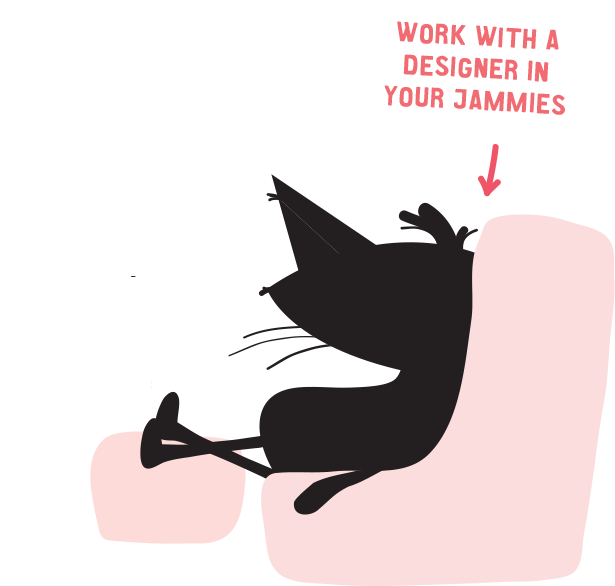 Schedule a video consultation so you can chat with a designer from your couch!